The Music Modernization Act (H.R. 5447) is by far the biggest update ever made to the music copyright law for songwriters. Its focus has been on improving the current laws surrounding the processes and amounts songwriters and musicians are paid today. The Music Modernization Act, or the MMA, is a long overdue bill that aims to simplify digital licensing and improve the compensation of music royalties to copyright holders. It has gone through several updates since its introduction in December and now includes supporting legislation to address legacy artists and behind the scenes copyright owners. Aside from being the first time in decades that we are addressing these areas of copyright law in the United States, this bill will make a significant impact on the music community moving forward. Over the past 6 months the bill has gone through a series of changes and updates. In order to bring you up to speed, we have pulled the key aspects of the legislation that will have the largest impact on the industry moving forward. The MMA was introduced to Congress by....Both Sides? In a time where it seems republicans and democrats are in an ongoing battle against each other, the MMA was introduced and is being supported by both parties. Yep. You read that correctly. This is being lead by both Republicans and Democrats. A long time in the works, H.R. 4407 was introduced to Congress in December by Congressman Doug Collins (R-GA) and Congressman Hakeem Jeffries (D-NY). Original cosponsors include Reps. Pete Sessions (R-TX), Marsha Blackburn (R-TN), Diane Black (R-TN), Joseph Crowley (D-Y), Steve Cohen (D-TN) and Ted Lieu (D-CA). Who would have thought that a Congressman from rural Georgia would find agreement with a liberal democrat from Brooklyn? Although this is not a part of the legislation, having both sides of the aisle work together to address and improve a broken system is an important thing to note. Why does this matter? It matters because when bills are sponsored by both republicans and democrats, they tend to move quickly, and continue to be invested in after the legislation is passed. The MMA will change the standard rate for compensation by switching to a market based price for songwriters and copyright owners. Recorded music did not even exist when the standard rates for compensation section of copyright law was created so, as you can guess, it is in dire need for an update. As it is written now, a statutory rate is given to anyone seeking a compulsory license to reproduce a song. This rate is currently determined by the Copyright Royalty Board and does not reflect market value. This is the main reason why you are hearing many artists today publicly blasting streaming services, with threats to pull their catalogs. Good news Taylor Swift. The MMA will be replacing this horribly flawed standard and force courts to determine rates based on what the market conditions are. The changes in the MMA will ensure that mechanical royalties that are paid out to artists and composers at a rate based on what a willing buyer and a willing seller would negotiate in a free market. 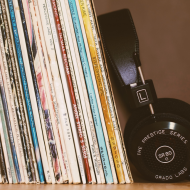 In order to fully understand the reasons for why people are so up in arms regarding the current laws surrounding music royalties, it is important that you understand some basics of music licensing. There are various types of licenses out there that have been created, but the most important licenses that are being discussed here surround mechanical licenses. 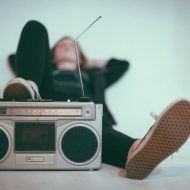 A mechanical license grants the rights to reproduce and distribute copyrighted musical compositions (songs) on CDs, records, tapes, ringtones, permanent digital downloads, interactive streams like Spotify and Pandora. This is different than lets say a sync license where music is licenses to accompany video, or even a performance licenses where the music is licensed to for performance purpose. This is strictly the kind of licensing you need if you want to copy a recorded song and resell it individually or as part of a subscription. every time a song you’ve written is manufactured to be sold in a CD, downloaded on a digital music retail site, or streamed through services like Spotify and Rdio, you are owed a mechanical royalty. Why do mechanical royalties matter now? Until now, digital streaming companies have been able to avoid paying mechanical royalties when they stream music due to the current Notice of Intent (NOI) procedure with the copyright office. This has been a broken process for decades that has not evolved with the pace of technology. Right now explicit permission by the copyright owners is not a requirement for selling and streaming music. When record labels do not provide that information to the digital services, the digital services have to submit a Notice of Intent to the copyright office. During the submission process digital services are able to stream and sell the music. The problem exists in the volume of submissions (which is in the tens of millions) and the backlog that it creates. This backlog has resulted in owners getting compensated in a timely manner or, many times, not getting properly compensated at all. This reform will ends this bulk Notice of Intent (NOI) process through the Copyright Office, ensuring that copyright owners receive the compensation for their work in a timely manner. The bill proposed creation of a new entity that will administer and has authority to grant blanket licenses for all musical works to digital media companies. Up until now, digital streaming services are primarily regulated by the labels which they have deals with. To help with this, the MMA will be creating a governing organization that will collect royalties for musical works used from digital services and pay them to copyright owners. This organization is the Mechanical Licensing Collective, or the MCL. The MLC will be requiring these streaming services to pay the proper mechanical royalties due, royalties which they are currently able to avoid paying due to the NOI procedure with the Copyright Office. Do digital streaming services like Spotify and Pandora have to go through this organization? No...not necessarily. The ones that do though( which will be all of them) will be sheltered from liability for statutory damages. Who is paying for this entity? Unlike ASCAP and BMI, the entity will be paid for by the digital music companies, ensuring that all royalties will be paid to copyright owners with no commission. Can streaming services still make deals directly with the artists or copyright owners? Yep and they can structure that payment deal however they want. Digital music companies and copyright owners will still be free to enter into their own voluntary license agreements. Where Does the CLASSICS Act Fit In? 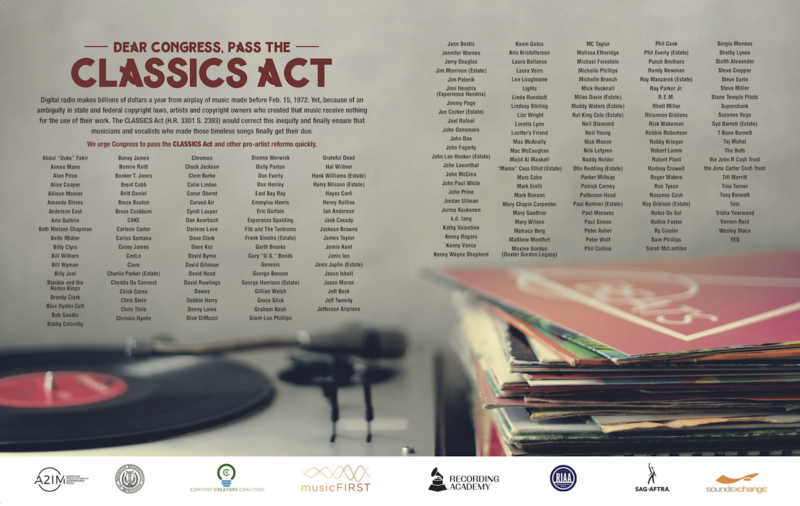 The CLASSICS Act is supportive piece of legislation that addresses unpaid royalties on sound recordings prior to 1972. As you can see above, this if supported by just about everyone. Click the image to view the advertisement aimed at Congress. This is fixing a loophole, plain and simple. Currently digital streaming platforms are able to capitalize on certain pre-1972 sound recordings without compensating the artists and copyright owners of these recordings. Why this is being addressed just now is beyond our understanding. Legacy artists, as well as current ones are unanimously in agreement that this has been borderline criminal. Extending the digital performance right to include all pre-1972 sound recordings is an important step toward making sure that the law includes and protects the contributions of all creators, and that legacy artists in particular are compensated for their work. ...and the AMP Act ? The AMP( Allocation for Music Producers) Act is another supporting piece of legislation, H.R. 881, that helps producers, sound engineers, and mixers receive copyright royalties for the work they help create. The AMP Act, which was re-introduced in the House in February by Rep. Tom Rooney (R-Fla.) and Rep. Joe Crowley (D-N.Y.), outlines a way for the players behind the scenes, i.e; producers and engineers, to receive compensation for their recordings. This extends to digital services( satellite radio and streaming services) and will mark the first time producers and engineers are mentioned in U.S. Copyright Law. Sound Exchange will be handling the payments. Up till now, these key contributors were forced to go directly to the artists, resulting in legal action and strained relationships between the two parties. We love to see these contributors are finally getting recognized for their work in the creation process. Every artist with a top 100 album will say that its success can best be attributed to the people behind the scenes. The Music Modernization Act (MMA) is by far the most significant update to music copyright law in a generation. Although it is still in the final phases of being passed, we believe the difficult part will be the implementation process. The one thing we have learned about the music industry is that there are the major players, and the 1000’s of supporting players that all have a stake. It will be necessary for all stakeholders to properly adapt and shift their business in order to make this work. Whether it be the songwriter, publisher, MCL, record label, engineer or even the various digital music groups, all parties should use this first step as a way to ensure music can continue to be created and shared with people across the world. On April 25th, the Music Modernization Act unanimously passed the House of Representative. Continue to stay up to date on the status of the MMA, the CLASSICS Act, and the AMP Act by following its progress on govtrack.us.